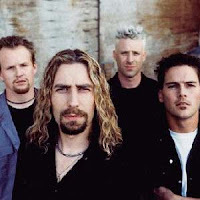 Nickelback will be dropping down to Alpine Valley, like a cold front from Canada on July 21st. It seems like the United States can only handle one Canadian band at a time. Staying power is what this band has in great supply. Their videos buck the super-fast cut, cut, cut trend, so they must be marketing towards the 30+ fan base. If you ever watch the Country Music Channel, you will see that their videos are much slower paced. Perhaps that's because those fans need the extra time to take in all those fancy lights and colors on the moving picture box. Don't get me wrong, I like the GAC videos that feature real country music. I'm way off track here. Nickelback's hit songs include Photograph and Leader of Men. When Nickelback was called out for having two songs that were nearly identical, Mike Kroeger replied "When you are a band that has a distinct style such as us or AC/DC, that happens." Excuse me Mike, you shouldn't put yourself on the same level as AC/DC in any way. AC/DC may have songs that sound the same, but they back it up with hits, fans, and rock that has lasted for decades.